Gornix (played by Gil) the salt-lotus wizard was huddled over his makeshift lab and deep in study over a length of scroll cut for scratch as he continued his formulations. Jirek who had been acting as lab assistant through the night excused himself come dawn and left for his job at the Bardic College library. With sunrise, the streets of Ezmer were beginning to awaken with street traffic, wagons, vendor carts, and all kinds of pedestrians. Among the teeming crowds and busy-bodies weaving through the tangle Excor (played by Cris) headed to the Red Helm tavern for breakfast. After a simple breakfast of eggs, salt fish, and honey-drizzled bittles he left to the Bazaar on a mission. He was looking for small cages, grain/feed, and 2 gunny sacks. He bought 10 cages (3 sp ea. ), two 5 lb. bags of feed (1cp/lb. ), 10 clay finger bowls (2 cp ea. ), and hired a porter at one silver piece for the day. Then the young mage and his hireling went to the lumber mill in the harbor and filled the two gunny sacks with saw dust for 1 copper piece per sack. After that, Excor and his porter dropped 5 of the cages, a water bottle, 1 sack of sawdust, and feed at Gornix’s apartment, the Salt-Lotus wizard barely paid heed to them as he worked at his makeshift spell-lab. After dropping the remaining 5 cages, 5 bowls, and 1 sack of sawdust at his own apartment he released the porter from his duty. Meanwhile across town in the Harbor District, Szoo (played by Isis) left his attic room with his roommate Paej Hagída (“Paeng”) leaning on the naga using him as a veritable walking stick. Peaj was still “pacin’ the deck” from the previous night. Paej, a consummate saloon bum and an experienced Ferenoi sailor. She was a nearly seven-foot tall woman with a face as sunbaked and salt-cracked as any of the oldest of the salty dogs but also possessed of an exquisite Amazonian physique. These hardened and statuesque features cut an impressive visage and coupled with fists like barnacled mallets she was downright intimidating. One of her finer points was that she knew every watering hole in the city very well. Szoo had invited his under-the-weather roomy to Ahsh Khhas’ Coil for some hair-o-the-dog, his treat in the hopes the Ferenoi might have access to some info. The pair limped their way across town hoofing it all the way to the hookah bar. Unsurprisingly, Paej was already well known there. The bartender without a word prepared and slid her ‘usual’ over to her as soon as she plopped down. It took several rounds for Szoo to start getting some valuable intel courtesy of Paej’s charisma massaged straight from the Scael bartender. The black-scale naga found out that Haxat the magnificent hung out at a place called The Rum Palace in the Eastern District. In addition, there’s a “black market” behind the place in a hidden courtyard which can be dangerous if you don’t know what you’re looking for. Also the Bronzeheads were currently protecting the wanted Naga assassin-sorcerer Ssthriss somewhere in the old broken wall. The 23rd of Early Summer, Gornix being finally finished researching his spell (Force Ram) headed to the tavern to join Excor, Szoo, and Fauna (played by Jenn) for breakfast. During the meal, Excor noticed that Fauna had burns on her palms and a fresh rope burn ringing her throat. He decided to keep that information to himself as the others didn’t seem to notice. After the meal they, as a group, decided to head over to and check out the Rum Palace. First however, they decided to stop at the Pester’s Guild and find Doubab at Excor’s urging. They were seeking the rat-catcher in order to purchase some rats offering 1 gp each up to a max of 6 rats. So Doubab said to meet him that evening back at the Helm and he’ll have their rats “alive and bitey”. From there they doubled back west to the Rum Palace, which was not far from the Pesters’ guild house. The Rum Palace as it turns out is an open front building in the small dirt courtyard before the broken wall where they had attended the rat fights more than a week ago. The split logs scattered in front were a place for its patrons to sit and drink. The Rum Palace consisted of a rundown single-floor building where open shudders revealed a bar from which the bar-back served the drinks. There was a gaggle of ruffians sitting on the split logs drinking and laughing spasmodically over crude jokes. The young mages felt out of place and more than a little uncomfortable save for Gornix. He walked right up to the drunken ruffians and asked if any of them had seen a mage named Haxat. He was very nearly assaulted and just to avoid a fight he endured numerous mean-spirited insults thrown his way. Surprisingly they all agreed and elected Gornix to approach the bar. The bar-back was an obese human of Westlander extraction with an eye-patch, long, stringy, grey hair, and a rotten-toothed sneer. It seemed every time the mage asked for something the bar-back laughed at him and hurled “we don’t got that either” with an attached insult or joke at the mage’s expense. Eventually, Gornix found out that the place only served grog. Therefore, he tried to buy a ‘jack of grog’ for ‘two bits’ but he also found that he didn’t have a jack so he had to rent ‘the loaner’ for a silver piece, an obviously deliberate overpricing, from behind the bar. It turned out that it had a leak. The uproarious laughter of the ruffians and the bar-back answered the frustrated look on Gornix’s face. As a result Szoo dropped some coin on the bartender. In turn the codger said, “Okay you can sit here at the board”. The young mages rightly decided to not stay much longer. Just before they rose to leave Gornix suggested that they should find Wensaer the alchemist and see about joining the Obsidian Guild but the others declined. Instead, they decided as a group to go find Jirek to see if he didn’t find any more out about the golden bee. So they footed it to the Bardic College library. At the front desk, the clerk passed them a sealed note, an unfamiliar sigil stamped into the red wax. Gornix cracked the seal and began to read the note aloud. So, there are those who would seek to keep me from my rightful property and interrupt my important work. I know of your pitiful little cabal and know each member’s name. I will seek each one of you out and destroy you. The first to face my wrath would be the betrayer Jirek Scribe of Arebas. If you would seek to seize your fates in your own two hands and value your comrade’s life meet me at the warehouse, I’m sure you know what I mean. Signed, Haxat the Magnificent the Menace of Skullhead. Of course they knew which warehouse Haxat had meant and thus with great haste made their way to Jirek’s warehouse. On the way, Excor heard wings flapping overhead tracking their progress. When they reached their destination, they could hear wings flap over and behind the warehouse. Gornix immediately tried to cast his new spell in order to knock in the front door. It seemed barred from the inside. He failed to correctly work the magic and the spell failed. In the meantime, Excor prophylactically activated his magic amulet of Shield. Gornix tried to cast his new spell again this time the magic got away from him (Natural 1 casting check). The spell was somehow inversed. As a result he was thrown back 50 ft. and suffered some mild bludgeoning damage to the chest. They all could hear the snickering of invisible imps on the roof. Fauna in turn cast Gaseous Form and slipped under the door. In the dark, dusty, and mostly empty warehouse she spied a stair down before lifting the bar opening the door. Gornix, last in line, was still dusting his cloak and pride off as he walked in. They decided the best course of action was to sneak down the stairs while being careful for traps. That plan went mostly belly-up as Szoosha proved to be somewhat incapable of being quiet at all when he moved. 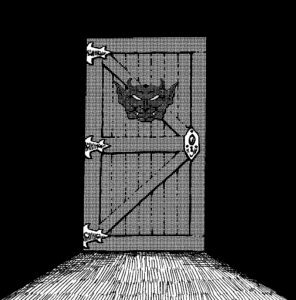 Though, Gornix still kept his eyes out for any traps while they descended the short winding wooden steps. They stopped at an iron-bound wood door at the bottom of the stair. 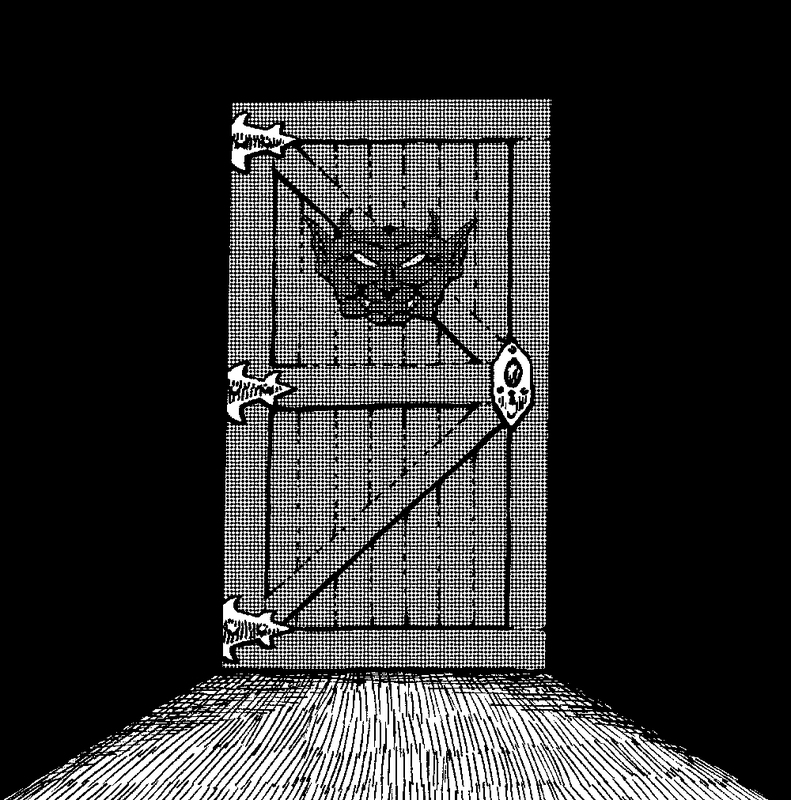 On the door was the red twisted face of an imp its mocking features twisting into a perverted grimace. Szoo was barely able to divert the flames of the creature’s breath weapon harmlessly away.